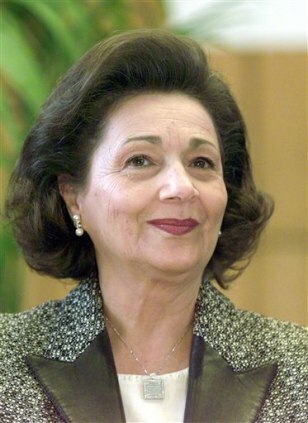 Suzanne Mubarak, wife of Egypt's President Hosni Mubarak, smiles at the Free University Berlin, in this Feb. 19, 2003 file photo. Egyptian authorities have ordered Mubarak's detention, the government-run MENA news service says. The move comes a day after the government reported that Mubarak and his wife were questioned over suspicions they illegally amassed vast wealth.